I have long had an affinity for Milly, which you may already know as I interviewed designer Michelle Smith (read it here) on the eve of her New York Fashion Week show. Why my admiration? Smith’s designs epitomize femininity with bold colors, smart silhouettes and timeless style (read: not trendy, but enduring). As I’ve noted before, it’s no wonder Gwyneth Paltrow, Victoria Beckham and Beyoncé clad themselves in Milly. But there’s a price to pay for quality and craftsmanship, which is why a Milly dress might run $275-$550 (unless you score it on sale—like I have at one of the Kristina Richards blowouts). That’s why I’m psyched about the new Milly/Banana Republic collaboration. 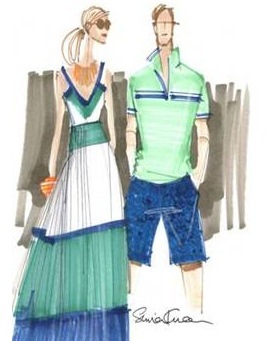 The limited-edition Milly for Banana Republic Collection — inspired by summertime in the Hamptons (or Newport, if you ask me…) — features over 60 pieces for men and women including maxi-dresses, cocktail dresses, tops, skirts, scarves, handbags, totes, clutches and accessories. Womens clothing ranges from $45 – $165 and if you subscribe to BR’s e-blasts, then you likely receive a coupon/discount offer at least once a week for added savings. So, if you’ve been wondering why the BR windows at the corner of Thames and Touro Streets have been so colorful lately, consider yourself officially in the know. Sew Fabulous! Au Courant Returns	I’m Bringin’ Sassy Bax…Yeah! Sounds like I need a trip to Newport! Tell me when–we’ll get out and play!! !